Create Apache Tomcat 6 as service.Create MySQL as service.Make MySQL service as the dependency to Apache Tomcat 6. Adding Calculation Field into the form.Creating Datalist.Creating Userview by integrating the process, form and lists. Joget Workflow is an open source web-based workflow software to develop workflow and Business Process Management applications. More than just a workflow or BPM platform, Joget offers full-fledged agile development capabilities (consisting of processes, forms, lists, CRUD and UI), not just back-end EAI/orchestration/integration or the task-based interface for traditional workflow/BPM products. So for example, build a sales force automation app instead of just a sales quotation approval process. This is the second part of the video to develop a Joget Workflow v3 app, in this case the Claims App. Earlier, we talked about on how to design a process. In this video, we will be showing you on how to design forms for the activities created in the process design below. We will be designing the following forms using the form builder. 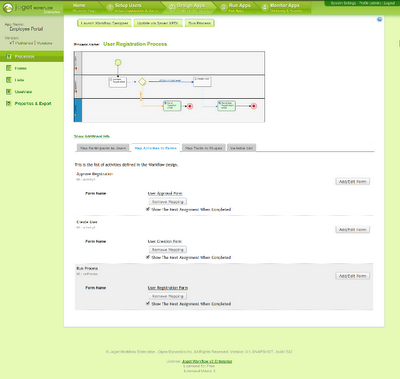 Creating form and mapping the form to a process activity.Using subform to populate existing form into form design. Generating Reference Number in the form.Using Form Grid element and Multirow Form Binder to handle multi-row/grid form data.Map form value into Workflow Variable to dictate the process flow.Automatically populate form field using hash variable. UPDATE! There has been an error in the process design. The activity "Approve Application by Finance" should be then follow on the same route as "Approve Application". We have reached another milestone. 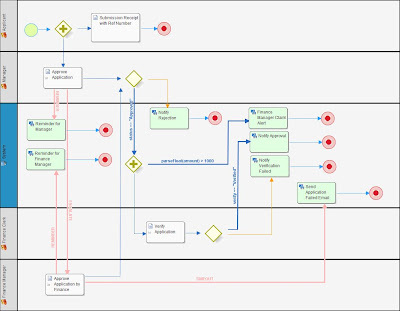 Today, Joget Workflow v3 Enterprise Edition is released to the world!